My new IIci failed today, just when I opened it up to install my new RAM. The previous tenant had an apparently ill-trained electrician install new electrical wiring in our office; depending on how I lean on the floor boards, ground appears to be carrying current. When plugging in the monitor I zapped myself, and seemingly the IIci, as it would no longer boot. Unlike the IIfx, the battery isn't required to boot, but I figured I might as well rectify this as long as I'm in there, especially since the corroded metal from the battery holder was getting all over the place. 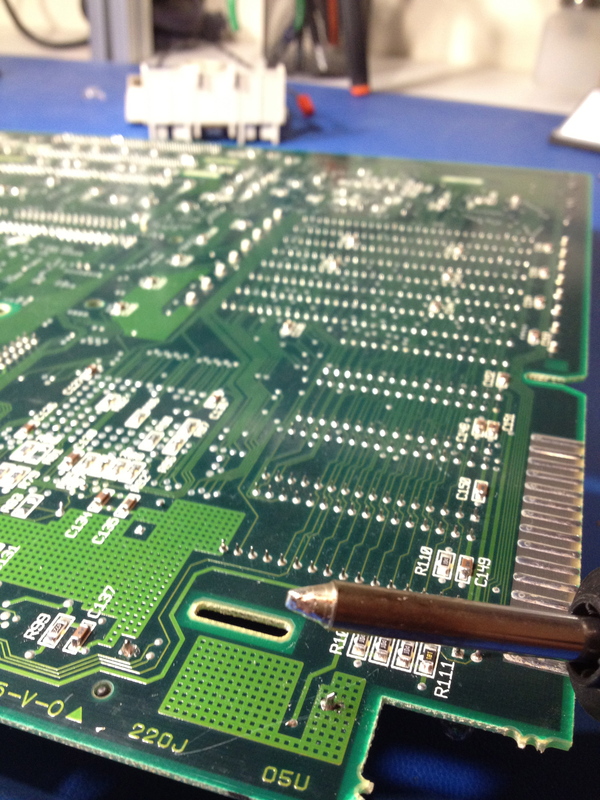 It's a quick job with the desoldering iron -- the battery holder is only soldered on via its two leads. I'll have to install those once they arrive. Next step for tomorrow is tracing out the startup circuit to see what is failing. I expect that the original caps are bad, but seems a bit funny that they'd decide to fail completely coincidentally at the same time I managed to zap things. I pulled the motherboard out and starting probing out the power circuit while trying to turn it on. I was seeing sporadic readings floating between ~1.25 and 5V across P9/P10, and then ... boom ... the machine started turning on/off reliably (<1v across P9/P10). At least until it stopped doing so a few minutes later. Despite the coincidence I'm going to just assume the capacitors are spent. Even if that's not the source of the problem, can't hurt to replace them. I verified the lengths with my calipers; the 7.30mm is a smidge larger than the existing capacitors, and the 3.55mm is a smidge smaller, but it looks like they should still be adequate. Now to wait for another Digikey order. Someday I'll have a sufficient stock of parts .. Still waiting for replacement parts to arrive, but in the meantime I've been reading up on the power circuitry. There's an in-depth discussion in Apple Guide to the Macintosh Family Hardware 2nd Edition in Chapter 6 (Power Supplies - Page 239). No schematic is provided, however; it's a basic block diagram of the power-control circuit (attached). It lives! I swapped out all the SMD electrolytic capacitors for the tantalum replacements I listed above, and it booted right up. I'm still not getting any audio on the built-in speakers, but I do get audio via headphones. Also, the machine will continually restart if I shut it down, as if I had the power button in 'server' mode. More to poke at later, especially since the battery + battery case haven't arrived yet, and I'll need to open it back up again when they do. I may have had better luck with smaller size capacitors (size C, 6mm), as the size I got (D, 7.3mm) almost entirely covers the pads. I reworked those joints, and the machine is much happier now -- boot chimes! However, there's still an issue with the power circuit that I'm trying to track down. Now I just need to figure out exactly what's going wrong in the power circuit. If I manually bridge the 5V trickle to the emitter of Q4, the mac will boot reliably. Likewise, it shuts down cleanly once booted. By my (currently, possible demented) understanding, pins 2->3->4->6 on UE13 should be going low when the power button is pressed, driving the base on Q4 low and thus allowing the 5V trickle current to flow across base->collector and trigger PS power-on. 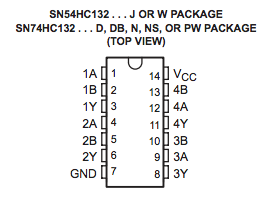 On the other pins and HC132 ICs, if the two inputs are high, the output is less than 5mV. When the power button is pressed, voltage on 1B drops, but 1Y still doesn't go high -- voltage on 1Y actually drops by about .100V. If I can replace the fan on this system, I might also give it a go on my other Macs -- they're all too loud. I'm new here, but I have a similarly complex IIci power issue to work out, on my IIci. My machine was mute, until I recapped it, and the sound came back. However, the power issue remains. My machine's issue is that, after running fine for approximately 30 minutes, it powers off. It will power back on for a very short time, before powering back offi, if the power key is pressed. If I wait a while, the machine will run for another 30 minutes, before powering off. 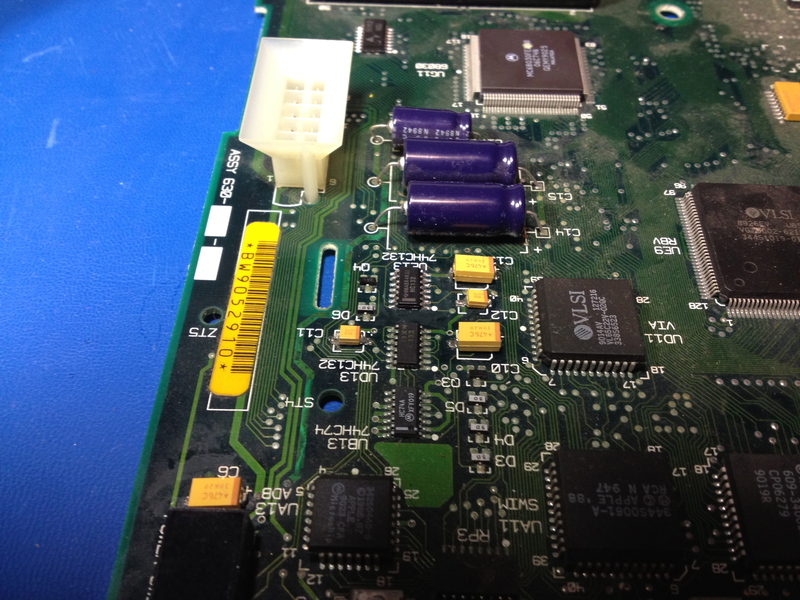 As mentioned, I have replaced every capacitor, both SMT and electrolytic, on the board, to no avail. 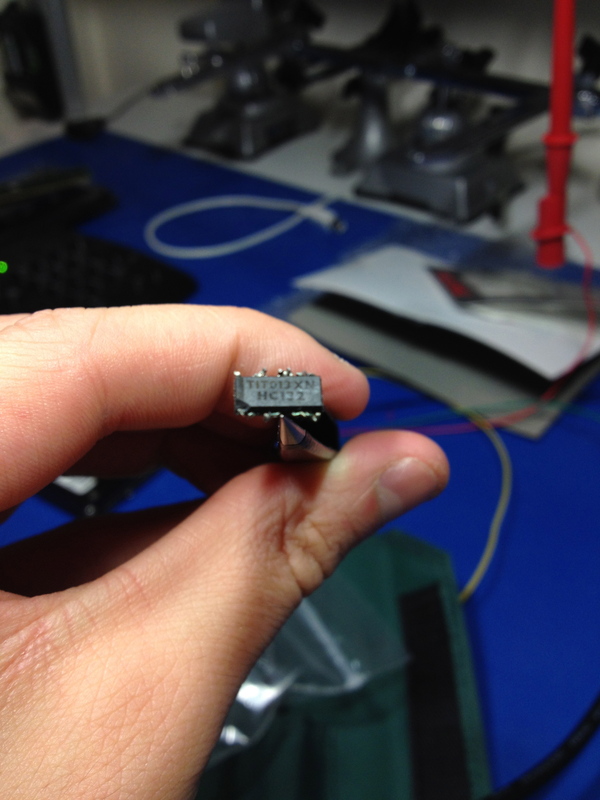 I will admit that my SMT soldering isn't the best, but I was able to fix the sound circuitry. I'm assuming, at this time, that some IC on the board is overheating, after about 30 minutes of use, and returns to functionality after it cools down. However, I've tried to find any hot ICs, several times, and have failed. I'm just about to the point of junking the board, and sourcing a replacement, but I hate to throw away all the work (and caps/recapping time!) that I have invested, especially given that any other IIci board that I get will also likely need to be recapped. 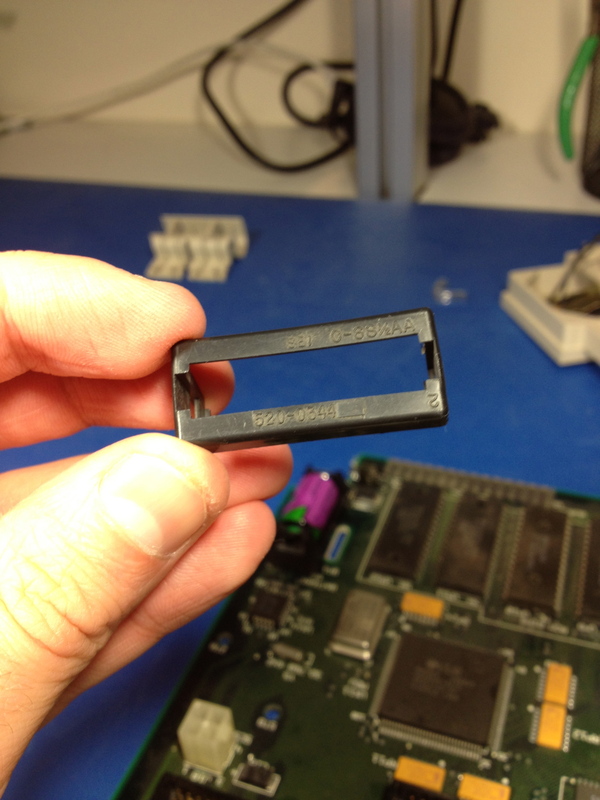 If the heat sink of the primary switching devices in a Macintosh II-family power supply exceeds a temperature of 125 C, the power supply shuts down. Before shutting down, the power supply pulls the / PFW signal low for at least 2.2 ms. Seems worth starting with trying to isolate the issue to either the PSU or the motherboard? Yeah, unfortunately, I had first thought it was the PSU, and so I sourced an up-rated Quadra 700 PSU, that was tested good by the seller, whom I know and trust. That didn't help, though. If it were easier to cable the PSU to the IIci when it was not installed in the case, I would have done more exploration, but I suppose that I can attempt to remove the PSU's outer case, and use an IR thermometer on it, to see if I can find any particular hotspots. I'm not inclined to use my finger, there, though. I have a bunch of investment into the IIci, so I'd really like to get it working. I have 128mb of RAM, a Turbo '040, an FWB JackHammer card, running a 4.3gb UW SCSI disk, a Radius PrecisionColor Pro 24XK, and an Asante 10/100 NIC. The IIci is my favorite of all Macs, as may be obvious. When working, this IIci is seriously fast. Heh, I'm a bit envious. When did the power problem crop up? 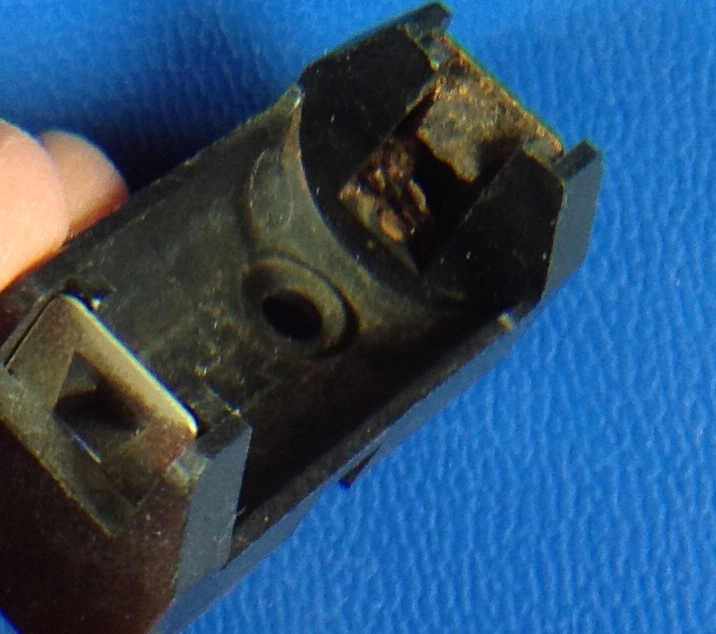 If any output of the Macintosh SE, Macintosh SE/30, or Macintosh II-familty computer is short circuited to ground (that is, connected to ground through approximately 100 milliohm or less), the power supply shuts down within 25 ms. 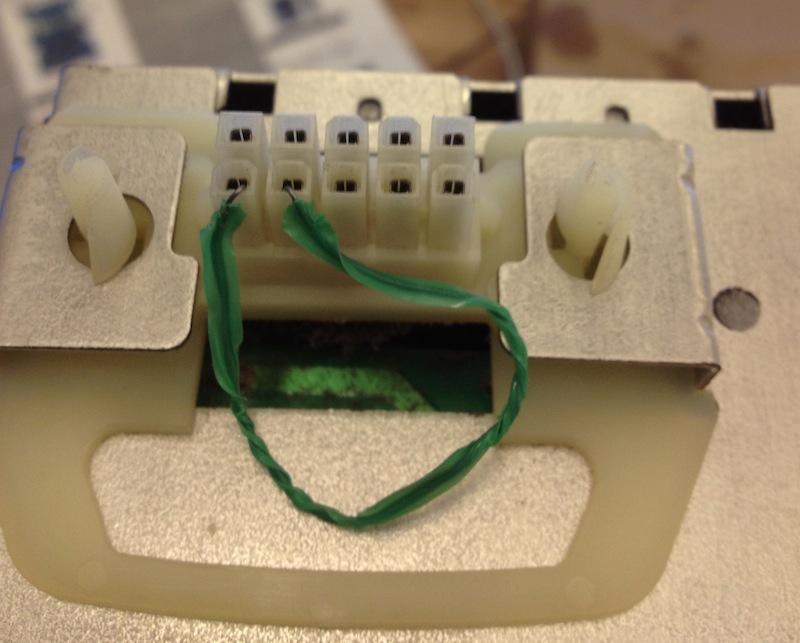 I suppose it's possible that a failing component could be shorting one of the PSU outputs? Perhaps you could attach a scope to the outputs and look for a short that occurs ~25ms before the PSU output drops to 0? Not sure what to use as a reference, ie, whether +5V.TRKL will stay active. If that's not the failure cause, then I guess it's a question of determining what is triggering the NAND gates to drop the +5V applied to pin 9 via Q3 in the above schematic, since I believe that's the only way for the machine to trigger a PSU shutdown. Thanks...I've spent some time collecting parts for this machine. None of the stuff I got was at all expensive, but it took some serious eBay/mailing list watching. Unfortunately, the power problem has been with me, as far as I know, since I acquired the machine. I likely didn't notice it immediately, since I was constantly installing and removing hardware and software. I also don't own an oscilloscope, nor do I have the knowledge to use one. That's something that I've been meaning to learn, but I haven't managed, so far. I really wish that I had a known-good IIci board to test with, but that's something I'm short. It's such an odd thing for the machine to shut down after working for a significant amount of time, and then after a "cool-down" period, start working again. That really says heat issue, to me. Since you tell me that the PSU is the only component with a temperature sensor in it, I really do wonder what is up. The PSU is the only thing with a thermal switch, at least according to the the Apple Guide to the Macintosh Family Hardware. However, that doesn't mean that it's not possible for other components to fail in ways (due to heat) that would trigger a power-off. As far as an oscilloscope goes, I'd suggest picking up a Rigol (eg, DS1052E) -- they're comparatively cheap, and I'm pretty happy with mine. It's pretty straight-forward to figure out, once you actually have one on-hand to play with. I imagine "go buy an oscilloscope" is not the most immediately helpful advice, but that's the general direction I'd personally start poking. I'm also trying to order some IIci schematics from http://www.bomarc.org/, so I may have a better general notion of where to poke about once/if those arrive. Thanks! If you hit a total brick wall on your IIci motherboard, I'd be willing to at least try diagnosing the issue locally (I'm in Brooklyn, 11201).